You’re here… about to secure a much brighter financial future. In fact, simply reading this means you’re well on your way. You've decided to do something that most investors are too afraid to consider – and for all the wrong reasons: trading. The funny thing is… trading is easy. And the advantages speak for themselves: lower cost, lower risk, and greater potential gains. And if you don't already have one or would prefer using a separate account for trading, here’s how to it. Charles Schwab is known for excellent customer service as well as great options trade execution. In fact, it was rated No. 1 in both "Customer Service" and "Trade Reliability" by Investor's Business Daily. It also offers a security guarantee: "Schwab will cover 100% of any losses in any of your Schwab accounts due to unauthorized activity." That's a promise that's hard to beat. Now, I was a former managing director at Charles Schwab, and I can personally vouch for the company's commitment to having satisfied and informed customers. But to be clear, I haven't worked at Charles Schwab in a very long time, and Money Map Press has no financial relationship with them either. I just happen to know how great they are when it comes to your trading options. I'm also giving them a shout out because I tend to use Charles Schwab's online trading platform as a model for both of my services, Money Calendar and Weekly Money Call, and also in my training guides. But don't worry if you have a different broker – most trading platforms look and work alike. Once you have everything, simply call (888) 279-0888 or click here. Charles Schwab will take it from there. And if you don't want to use them as your broker, that's fine, too. After all, you're the only person who can decide which broker is right for you. Just be sure to do your own research before you commit. Charles Schwab isn't the only online options broker around. In fact, there are dozens out there, all specializing in different things. While I can't personally vouch for any of them, many of my Money Calendar Members, Weekly Money Call charter Members, and students have told me that TD Ameritrade and Fidelity work well for them. You're already way ahead of the investor pack – but you've still got a few more things to do. And one of those things is getting your options clearance. Simply put, this determines which types of options you can trade. And all you have to do is answer a series of questions. Don't worry – I'll walk you through it. You've already chosen your broker and started the process of opening your options account. That means you're almost ready to trade. So naturally, the next step is trading, right? But before you can actually place your first trade, you've got to get your "options clearance." Now, this won't get you access to any classified information… but it will get you approved to start trading options. Options clearance is basically when your broker asks you a series of questions to determine the types of options you'll be able to trade in your account. And I've broken down the process of opening your options account into five very easy steps. 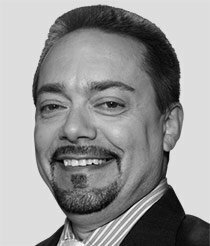 Now, keep in mind that while all brokers will ask you these questions, the specific order and phrasing will vary. 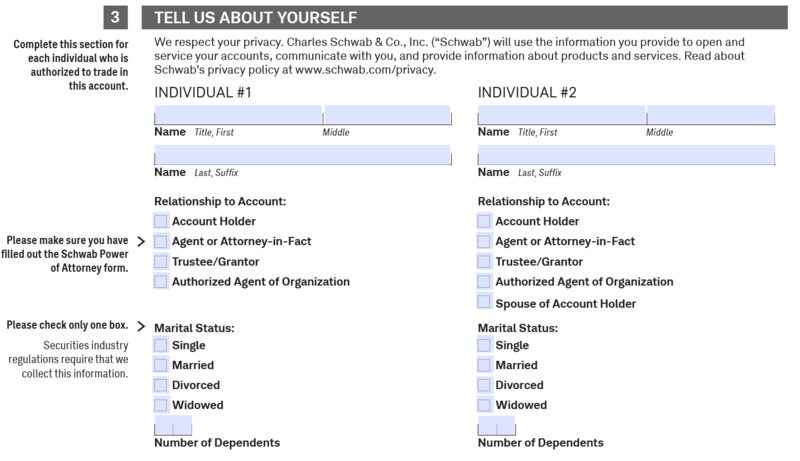 In this guide, I've given you examples of the questions you'll be asked based on Charles Schwab's application process. 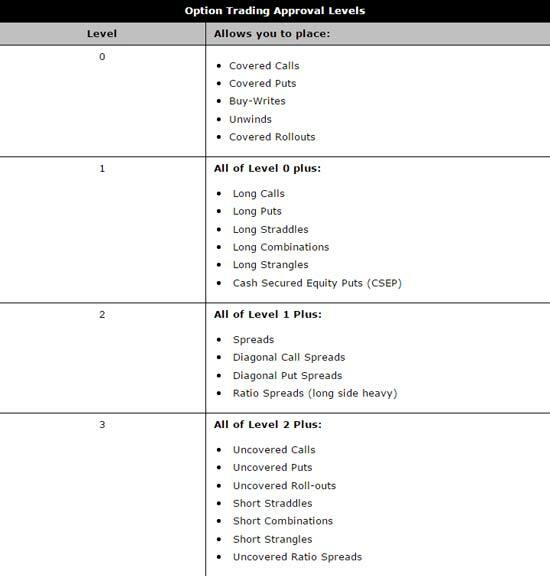 The first thing you need to do is get whatever clearance lets you buy "calls" (green trades) and "puts" (red trades). Clearance levels can vary from broker to broker but typically include four levels (some include five). Here are the clearance levels for Charles Schwab. For both of my trading services (Money Calendar and Weekly Money Call), you'll need clearance for long calls and long puts. In the chart above, this means you'll need to get level 1 clearance. Sometimes, however, I recommend more advanced trading strategies such as the "loophole trade," or "spread trade." But don't worry about that right now… we'll get to what that is and how to place a loophole trade in my "How to Place a Loophole Trade" guide. 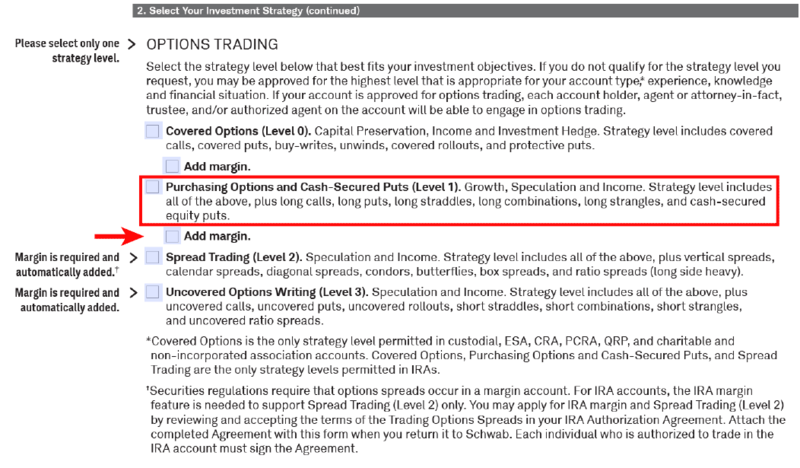 The other thing your broker will ask you is whether or not you want "Margin Trading" or "Margin" added to your account. A margin account is a basically a "loan" given to you by your broker. This allows you to enter certain trades that could potentially end up costing you more money than you initially put in them. You don't have to worry about this when it comes to either of my services, though. Since you only need, at minimum, level 1 clearance, Charles Schwab (and some other brokers) won't require you to open a margin account. And keep in mind that you can always apply (or re-apply) for a higher clearance level. All you need to do is call your broker. After you've chosen the clearance level you want, your broker will then collect your personal information (such as your income, employment, and trading experience). Like the clearance levels, these questions could vary depending on your broker, but the purpose is the same: to verify your identity and determine your suitability for options trading. 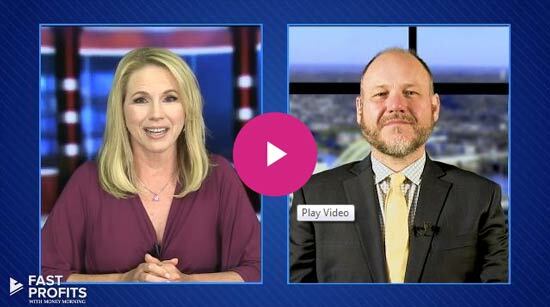 This is what you can expect using Charles Schwab's options application. As you can see, this information is really no different from any other financial application you might complete to, say, open a checking, savings, or retirement account. 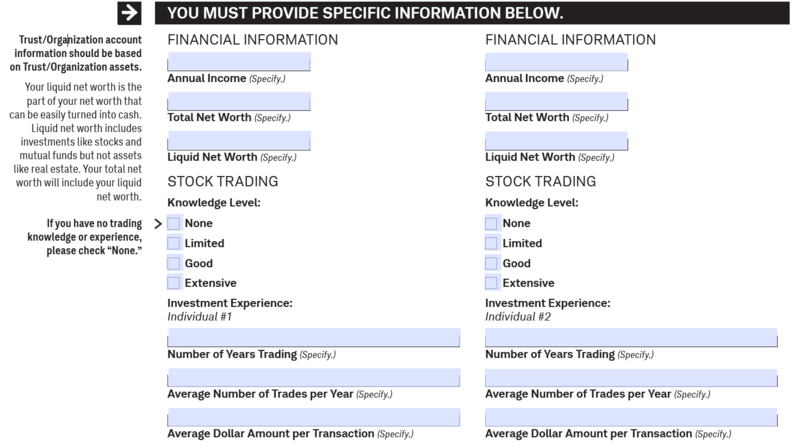 When you get to questions about your annual income and net worth, remember that this is only used to determine what types of options you can trade as well as to verify your identity. It's similar to the information you'd provide when filing your annual tax return, too. Charles Schwab (and many other brokers) ask for both "Total Net Worth" and "Liquid Net Worth." As the definition in the margin explains, "Liquid Net Worth" includes all investments that can easily be turned into cash, including funds, stocks, and so on. However, "Liquid Net Worth" does not include any real estate investments. So don't include the value of your house here. Your "Total Net Worth" will include all of your "Liquid Net Worth," as well as any illiquid assets you may own (such as real estate). And don't worry if this seems too complicated to figure out on your own. Charles Schwab, for example, has the Personal Net Worth Worksheet you can use. 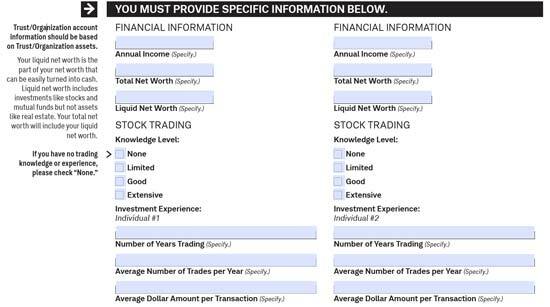 There are also plenty of calculators and other helpful tools online you can use, such as the "What is My Net Worth?" Calculator. The second-to-last step in getting your options trading clearance is providing some information about your trading experience and knowledge. 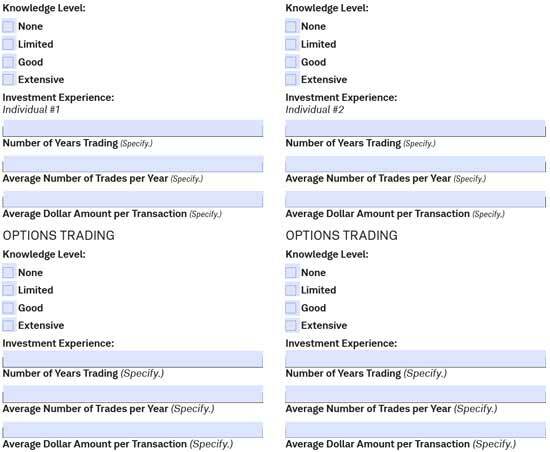 Now, this isn't a trick question… you'll want to check the box under knowledge level based on how much you know about options trading. 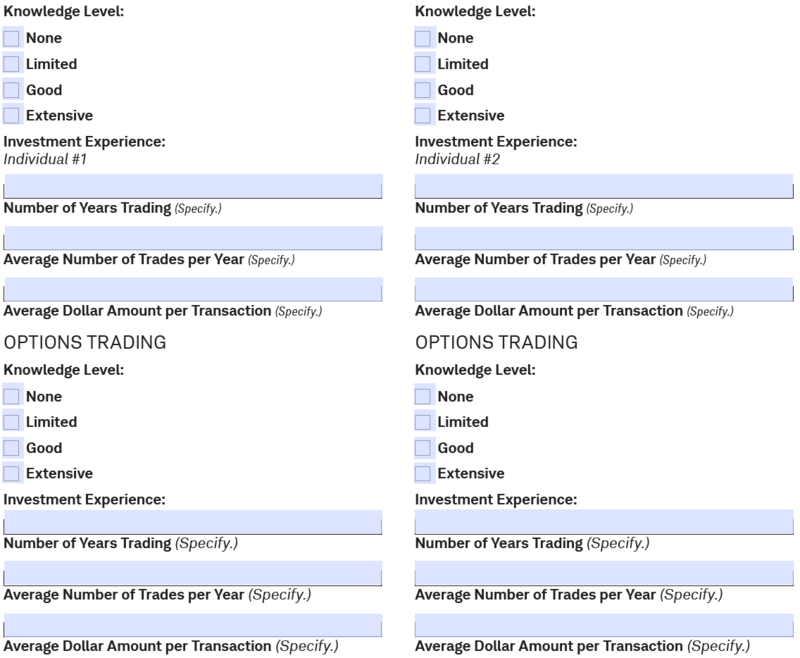 If you've never heard of options (until now, of course), you'll want to check the box next to "None" under "Knowledge Level." If you've heard of options before, then you'll want to check the box next to "Limited" under "Knowledge Level." If you're pretty familiar with options, you'll want to check the box next to "Good" under "Knowledge Level." And if you know options like the back of your hand, then go ahead and check the box next to "Extensive" under "Knowledge Level." If you've never traded options before, you'll want to check the box next to "None." 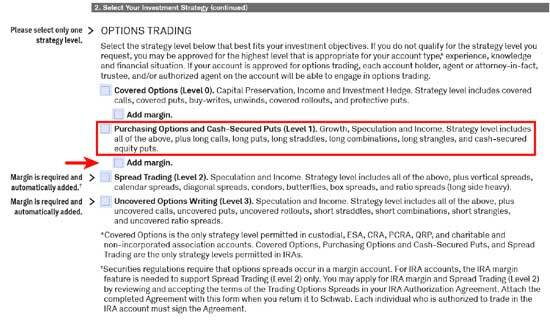 If you've placed an options trade before but are still pretty new to them, you'll want to check the box next to "Limited." If you trade them pretty regularly, you'll want to check the box next to "Good." And if you're trading options like a pro, then go ahead and check that box next to "Extensive." Now the only thing left for you to do is sign and mail, fax, or upload (depending on your broker) your application. That's it! And remember, if at any point during the application process you have any questions, don't hesitate to call your broker and ask. Their job is to help you, after all, and they'll able to clear anything up in no time. I've provided below the telephone numbers to Charles Schwab, TD Ameritrade, and Fidelity. The next thing to do while you wait to receive your options clearance is to take some time to get familiar with how to trade options. You can take a look at my "How to Place a Green Trade" and "How to Place a Red Trade" guides for detailed, step-by-step instructions on how to do that. Once you get your clearance, I'd also suggest practicing placing your first few trades using your broker's "virtual trading" or "paper trading" system. These allow you to enter, follow along, and exit a trade as per usual, but without using any money. Now, of course, that also means you can't make any money. But it's a great way to get acquainted with options in general and your broker's platform in particular. I recommend all my readers use paper trading until they get comfortable – in fact, I wish I'd used it back when I first got started with options. And remember, if at any point you're not sure what to do, never hesitate to contact your broker. As a customer, they owe you time on the phone to make sure you're buying the option you want to buy. For Schwab, call (800) 435-4000. For TD Ameritrade, call (800) 669-3900. For Fidelity, call (800) 343-3548. Just read them the original entry and exit/profit-taking strategies you received, and they'll be able to tell you how to enter your trade correctly. We just unveiled a trading phenomenon that can deliver daily trade recommendations with unbeatable money-doubling potential. We're talking $3,000, $4,000, even $5,000 per day. You can make these simple plays in less than five minutes, straight from your phone or computer, from anywhere in the world. And in a few minutes, you could change the course of your financial future forever.